The Drunken Wobblies have released a new song, the sales of which are benefiting the ABCF just in time for their 2014 tour. The song titled “No Peace” was released on Aug 10 for Prisoner’s Justice Day. On August 10th, 1974, Eddie Nalon bled to death in his cell at Millhaven Prison in Ontario. Every August 10th since then, Prisoner Justice Day has been used as a way to remember every prisoner who has been treated as less than human by the system. 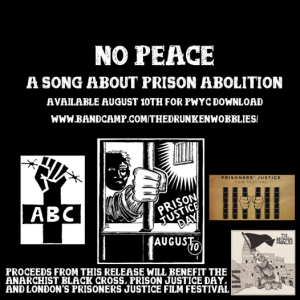 All proceeds from the song will be split between the Anarchist Black Cross, Prison Justice Day, and London’s Prisoners Justice Film Festival. Aug 30 – Providence – ? Please support artists who support political prisoners! This entry was posted in Uncategorized on August 21, 2014 by admin2.